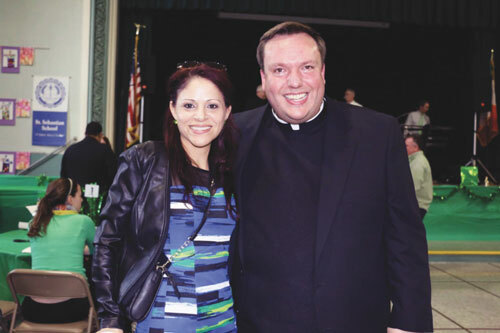 Father Kevin Abels, pastor, and Alma Mendez, administrative assistant, at St. Sebastian’s, helped lead the Generations of Faith campaign in the parish. With a goal of $1.4 million, Father Kevin Abels and his St. Sebastian’s parish community in Woodside were very nervous to begin the Generations of Faith campaign. They responded so well that not only did St. Sebastian’s reach its $1.4 million goal, but also far surpassed it by raising $1.7 million from just over 600 pledges, an incredible accomplishment. Father Abels grew up nearby in Middle Village and has been pastor at St. Sebastian’s since 2014, with his first assignment being at the church back in 2003. Approximately 6,000 diverse parishioners attend Mass at the church in Queens every Sunday, coming from Irish, English, Filipino and Hispanic heritage. This year, St. Sebastian’s is 121 years old, coming close to celebrating the 125th anniversary in just a few short years. Father Abels believes that Generations of Faith provided people an opportunity to express their love for their community and parish. “I just continue to see that people love this parish and they come through. What makes our parish great is that people give,” he explained, adding that the church is not made up of high-level donors, but rather encompasses more of a middle-class community. He said that during the public phase of the campaign, when everyone pulled together to show their tremendous love for the parish community, they were able to achieve and exceed their goal. Father Abels incorporated one-on-one meetings along with weekly receptions and outreach to parish ministry groups in order to connect with as many of his parishioners as possible. He also utilized his parish staff, including assistant Alma Mendez.